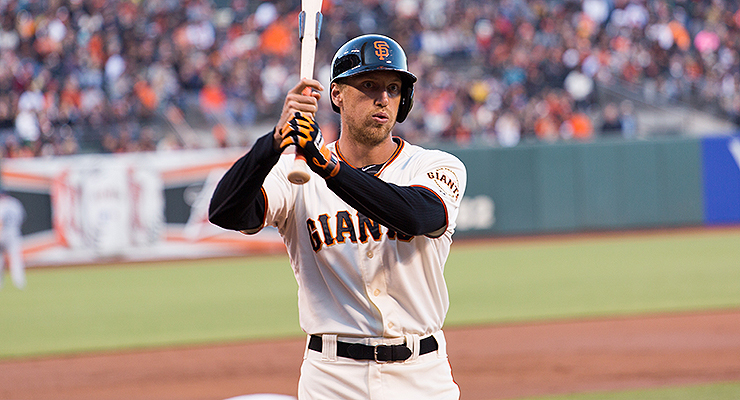 Hunter Pence knows that if you can focus, it doesn’t matter how strange you look (via Andy Rusch). Being on deck is more a state of mind than an actual place, and that’s not just because nobody actually spends time in that quaint little painted circle any more. The mental space between spectating on the bench and participating in the game is complicated, if you believe the calisthenics and rituals you see performed there. And yet the goal is simple: relax and get ready to play. But push Pence a bit, and you get an answer. “I’m just trying to get ready to hit. I don’t realize I’m doing it, it’s just what I got,” he said. It’s not a great answer when it comes to nuts and bolts–what about that collection of swings prepares him for his at-bat, exactly–but it does help us understand the mindset of a person on deck. He’s focusing, and as you can see from Pence late in the video above, he’s focusing at least partly on the pitcher, in an effort to time his offerings. Sometimes the exaggerated swings you’ll see on deck have very specific meanings. Take a look at Mike Morse’s particular brand of lunacy. The reasoning for the over-exaggeration might be suspect. It sounds so great when the player says it–“When you swing in the game, you want it to be free and easy. Practice at a certain level, so that in the game it’s easy.”–but the science doesn’t quite agree, at least not when it comes to donuts. Weighted bats have been shown to have a detrimental effect on bat speed, at least. The good news for Morse is that the big knob at the end of his bat keeps him from using the donuts. And there’s no study linking crazy on-deck swings to reduced performance. “It’s much easier for your hands to drop than anything, so by swinging with the high hands, I’m trying to remember to keep my hands high,” Jaso says. The key, though, is that he’s not thinking about it too hard. He’s practicing a key element, but he won’t be thinking about his hands when he gets to the plate, he hopes. Because, with the reactive state that is hitting at the plate, you don’t want to be thinking about too much. Justin Morneau relies on his routine to prepare himself to think without thinking, in a similar way. “The amount of things that you can limit that you have to think about that are just routine or habit, that helps you concentrate on what you have to do,” the Rockies first baseman said. There’s a calisthenic element that’s more clear with some than with others. Take a look at Ichiro Suzuki getting ready to hit. He’s making sure that his muscles are ready, or at least that’s what it looks like. And that helps explain some of Pence’s routine, and some of the movements Jaso makes while getting ready … some of it is just warming up. Ask a hitting coach, and all of these things come into focus as part of one workflow situation. Dave Hudgens sounds like one part Morneau at first. “We always train the minor league kids to have a routine. That routine starts long before the on-deck circle,” said the hitting coach most recently of the Mets. Hudgens would train hitters to begin that routine by researching the pitcher in the dugout and refining his approach, and then continue that research into the on-deck circle. “The hitters have a lot of information before the game begins, but live action is always most important,” Hudgens says of the scouting you can do from the field as you get ready. Then he sounds like one part Jaso, too: “This is a place to get your timing and any mechanical thoughts or keys.” One of Morse’s keys, or important facets of his swing, is the shift of his weight from the back foot. Jaso works on his hand placement often. By including this work in their on-deck routine, they’re reinforcing work they’ve done in the cage and reminding their body of good habits. And they’re doing it without thinking. The last thing that Hudgens talks about–“As the hitter approaches the batters box, he will now know the situation and what his approach should be”–resonates well with what Evan Longoria says in this video about the on-deck circle. It’s interesting that Longoria points out the difference between an amateur and a professional when it comes to last-minute preparations. The major leaguers do want to get a little practice timing the pitcher, but they don’t need to watch each pitch from the opposing starter. They’ve scouted that pitcher with video extensively with tools that are not available in amateur baseball. So listen to Longoria as he ends the video talking about being relaxed. Since “the work is done,” and the player has put in his time preparing for this moment, the on-deck circle becomes a place where routine helps the player warm up while relaxing. Since that’s a bit of a complicated goal, it’s maybe not so surprising that each player seems to have a different way to accomplish it. That’s it, then. Do whatever it takes to get locked in. The self-centered on-deck rituals ignore another responsibility: helping the runners on base. The on-deck hitter when Cespides made his great throw last week is a prime example of lack of attention to this detail. Rather than being positioned in line with the 3rd base line to be in position to direct and help the runner plan his slide, he was in the on deck area on the 3rd base side, bar in left hand, circling his right hand in a “hurry-up” manner. Great anticipation! I can’t find video anywhere for it, but Jason Heyward does this extremely odd swing thing right as he leaves the on-deck circle for his at bat. It doesn’t look to be even remotely helpful, from a baseball standpoint. Please ask him what it’s all about! I’ve been dying to know! Hah! I was about to say the exact same thing. Heyward does look weird when he’s on deck. I’ve been trying to figure out what he’s working on when he’s doing that weird upper-cut motion for years. Eric Sogard, another Oakland A, looks like a little kid pretending to get a big hit. Its pretty funny to watch. His mouth even looks to be making a ‘swoosh’ sound as he swings.